Mini disclaimer, this is not a kayak story, but an inside the gate every day story that moved me enough to write and photograph. Feel free to skip since this is not a water adventure...…. Was reviewing our fiber optic drawings at my office on Kennedy Space Center and noticed a fiber optic cable segment was missing from on one of the drawing sheets for a remote radar site. So I took our buried cable location equipment (glorified metal detector) and drove to the area in question, which is a remote section of scrub oak and pine north of the New NASA Headquarters building (almost complete as of mid 2018) and attempted to follow the buried cable so I could update our drawings. 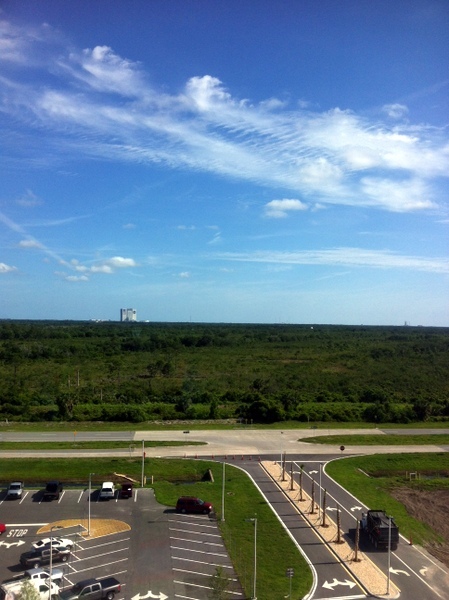 View from the new KSC NASA Headquarters building. 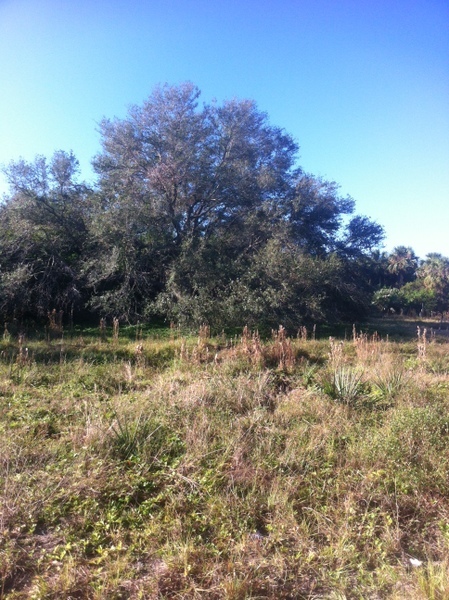 Looking north towards the VAB is all forest with bobcats and turkeys. On the remote little used road I had to slow down for a whitetail deer with an impressive set of antlers (for a Florida buck) standing in the road and snorting at my car. The deer (and turkeys) have only recently re-colonized the south end of the space center-that in its self always an odd fact, because on the other side of the Banana River; on Cape Canaveral Air Force Station, the deer population has been at nuisance levels (dangerous to drive at night) since I was stationed to CCAFS in the early 80’s. To see a buck this far south was a pleasant and unexpected surprise! 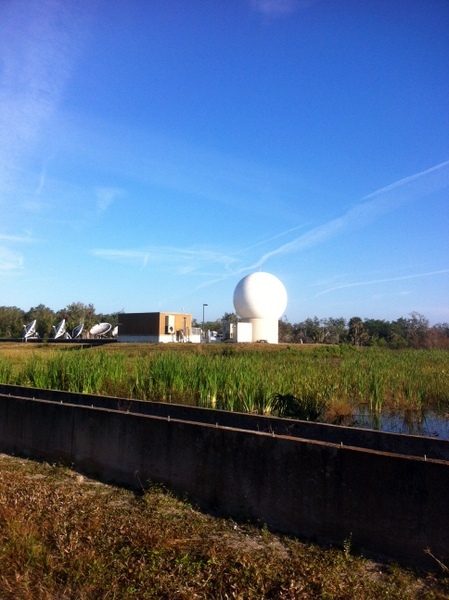 I arrived at the remote radar location & got out of the vehicle to set up my tracing equipment. I always get a kick out of the fact that my days in the USAF and then in the Caribbean islands we used bent coat hangers (dowsing rods) to very efficiently trace and mark buried cables.-(I can get into that on another page) However since we are currently in the “Space Age” there is high tech equipment available for this task. I scanned the area for the buck and observing the area had not been mowed in years, tall weeds that could hide a KSC cactus-or worse. The area was overgrown -although I recalled there had once been abandoned 'ghost town' like buildings at this location in the recent past. -Where there had been buildings was now a field with the forest edges creeping towards the center of the open area and the antenna site. Fiber optic cable is glass & therefor cannot be traced in the conventional sense of following a metal object. Consequently on KSC we have been burying a copper wire with all optical fiber cables. 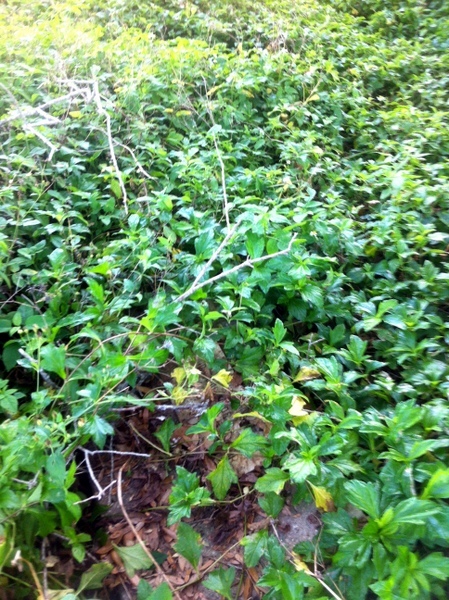 I located the nearest communications manhole and began to sweep the area for the copper wire-locating it with the increased beep-beep-beep that indicated I was directly over the wire and glass cable and so set off tracing the path, following the beep-beep into tall weeds and Florida jungle. Too late for chigger spray once I realized how tall the weeds were. And...the thickening flora was becoming a little worrisome, as Kennedy Space Center is quickly becoming the last bastion of east coast Florida Diamondback Rattlesnakes (protected on KSC) but these strikingly handsome and dangerous snakes are slowly disappearing from the "over development" of the Florida coasts and feral hogs have been rooting up all snakes in the remoter areas of the state. -If I have my snake facts correct, the Eastern diamondback is the second largest native snake species in North America, (the beautiful Indigo snake being the largest) & both thriving on KSC except in the feral hog zones. What the heck had I tripped over? 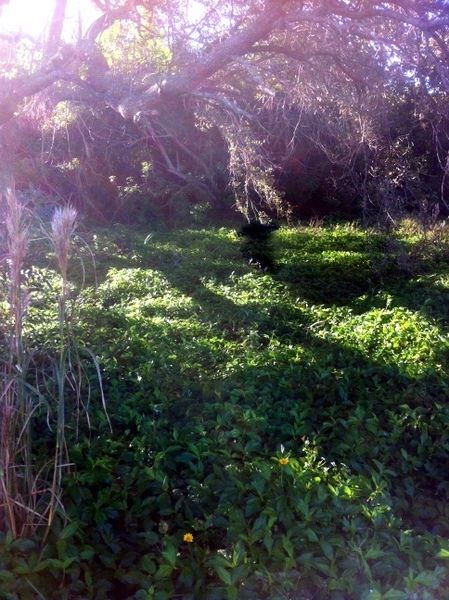 However it was not a snake I found in the thick brush…. Pushing through thigh weeds, following the beep-beep until I was under a large water-oak; I literally fell over an unseen rock, arms flailing & falling face first into chigger/tick, saddle burrs and other sticky seeds weeds. Little crawling weed spiders scrambled off of me as I quickly extracted myself from the far too alive weedy ecosystem. When I stood up I quickly scanned the area to see if anyone had witnessed my embarrassing fall. I was by myself near a remote set of antennas. The buck was probably the only living thing for a good bit. Well I hoped there was not a rattlesnake in the weeds. What had I tripped over? Rocks on the east coast of Florida are about as rare as a winning lottery ticket. Tripped over a log? 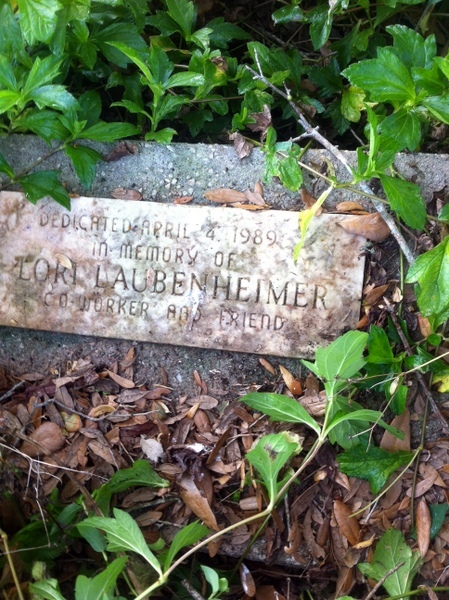 A grave stone? 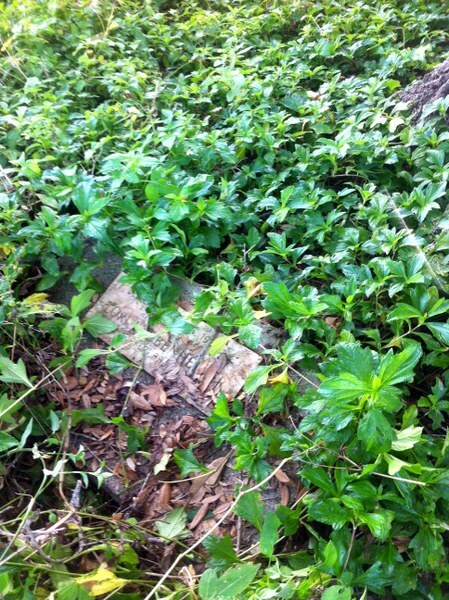 I pulled the weeds back to expose a carved marble plaque. More weeds yanked away exposed the word "Lori". A gravestone then. But then I saw the date: 1989! Twenty-five years after the government had used the eminent domain to seize the lands around the new space center! So what had I discovered? I read the entire plaque and goosebumps appeared on my arms and for the second time I looked around-still alone in the wilds of the space center- for I recalled the story one of my friends in KSC security had told me laughing about a co worker in the security forces who had called in a night report about seeing a woman walking down the road I was parked along. No woman was ever found, nor recorded on the dash camera and my buddy had laughed out loud as he termed the other officer a "--------g idiot" for hallucinating or something. "You either see someone or your eating -------g mushrooms" said my friend who definitely did not notice world in shades of gray. Yeah well I did look around the oak tree and briefly cursed myself as an idiot for childish thoughts and picking burs and beggars lice from my clothes; continued following the fiber optic cable. Marking my set of engineering drawings. Then packed up and returned to my desk computer to enter the information. 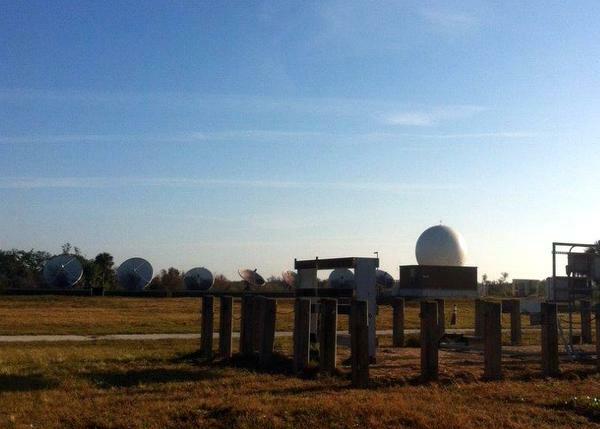 Final look at the radar dishes. I was sort of creeped out. The Internet is an amazing thing. I typed in Lori's first and last name and read about a tragic accident on Kennedy Space Center-which I choose not to go into on this page. Also out of respect I decided not too write down her last name. A final search of search of old aerial records showed a photo of the old buildings that had once stood where now I only saw an open field and tall weeds. 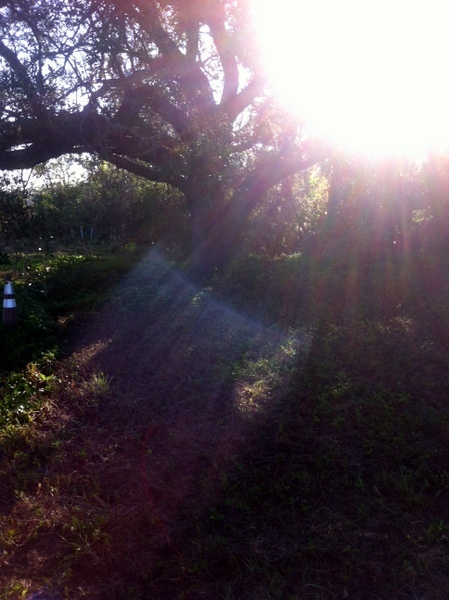 And of course an oak tree with a lonely hidden marker. Why the abandoned or demolished buildings?